The previous two tutorials explained how you can create a contact or add an email sender to your contacts list: Gmail lets you add as little as a name or email address for each contact, which is convenient, since you may not have all the person's information at that time. But can you update the contact's profile later on? Yes, and quite easily as you'll see in this tutorial - note that we explain how to update a contact's information from your "live" Gmail account (your "Contacts list") - in other words the one you use when you check your emails from a web browser. If you have configured Gmail in an email program, that application will have its own address book that manages contacts. If needed, login to your Gmail account. The standard text fields you can change are the Name, Email, Phone, Address (physical), Birthday, and URL (to add a website for that contact), and "Notes". Just type the information you want to add or change. To change a contact's name, just click on it: it doesn't look like an editable text field, but it will become editable text once you click on it. And to add a picture to the select contact's profile, click on the "Add a picture" link / button displayed above the generic photo. 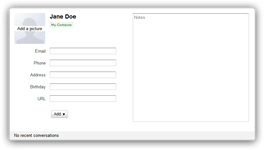 These are the standard contact fields: but notice that Gmail includes an "Add" dropdown menu below all of these: this allows you to add less common types of contact information, like "Phonetic Name" (how you pronounce the selected contact's name), "Nickname", "Title And Company", "File As", "Email", "Phone", "Address" (an additional one), "Date", "URL" (a second one), "Relationship", "Instant Messaging", and "Custom..."
Perhaps the most important of these option / additional contact fields is "Custom" - it allows you to add your own fields and collect more detailed information about your contacts, that either do not fit any of the standard fields, or you want to track separately from a generic "Notes" blurb. This is all it entails to update the profile of a person in your Gmail Contacts list. Once you've updated the selected contact's information, click on the "Save now" button at the bottom. Note that Gmail will automatically save the new information you added as soon as you press the "Tab" key to move to the next field (or when you hit Shift+Tab on your keyboard to go the previous text field).